Great things come in small sizes, but not too small… This bag is spacious in all the right places. Each of our Artisans take very seriously the initial selection process of choosing exactly the right piece of canvas and leather for each bag, and that job isn't too difficult because we source our 24oz filter twill waxed canvas from one of the most respectable and long-running suppliers in the USA. Same goes for our leather, full-grain, tremendous quality stuff that ages like a fine whiskey. 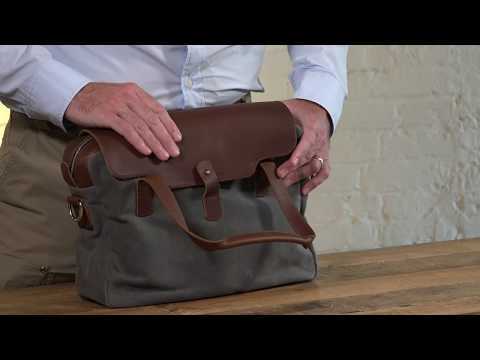 This is a canvas leather briefcase that will last and last. This is all held together with marine grade, UV-resistant stitching that is so reliable they use it in parachute construction. We recognize that the weight of experience is the best way to measure expertise so we turn to artisans and craftspeople that are part of a proud tradition of skilled workmanship and time respected techniques. Each bag feels the full weight of that wise touch and because of this, we have discreetly placed the signature of the artisan that made it in your very bag. Forged nickel hardware with high brass content and rivets are placed at key stress points in order to make this bag supremely strong. We did not overlook the metal zipper either. It is the best zipper on the market, engineered to exacting standards in Japan, and polished to smooth and soft while also incredibly durable. No black cloud can ruin your day. We made this bag to get you through a surprise sprinkling of rain worry-free. Our waxed canvas sloughs off drops like a peach and when combined with our full-grain water-repellant leather overlay really keeps you safe from storms. We do more than talk a big talk, we back it up with a 25-year leather warranty and a 30-day money back promise. So even if you are a what we call a "super-user" and are really hard on bags, you can feel confident to go about your life with our bags backing you up all the way. Picking a briefcase is no small thing, it is practically your co-worker, but we are confident you couldn't find a more competent one than this.